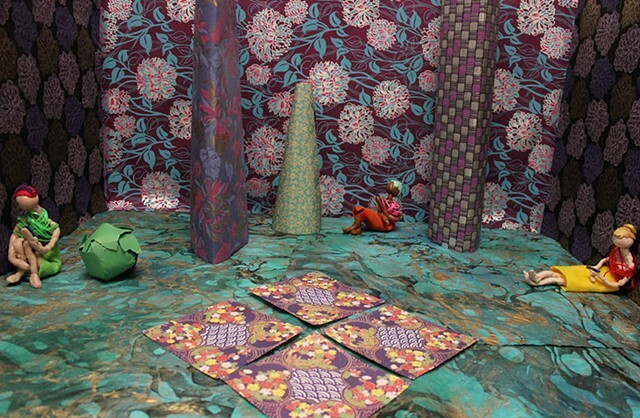 In my stop motion films, I create fantasy worlds of pattern and color to tell abstract stories that reflect human struggles in reality. The heroes of my animations are female and my work is inherently feminist, dealing with how women confront problems of the contemporary world. In LOST CONNECTION the three protagonists face the isolating nature of modern communications. Our modern world often seems like a science fiction novel, as people live more and more vicariously through their phones and computers. My heroines try to reach each other through phones singles, but ultimately realize that there is still a very present distance between them. For my animation I usually start with a feeling I would like to convey through my films versus a concrete narrative. For this film I started with the emotion of isolation. In addition to Visual Arts, I also study Communications and I am very interested in the effects of communicating through things like texting and online messaging. This film deals with how it feels to be a modern communicator, especially as a woman. The second part of my process involves color theory. For each of my films I like to choose a powerful color palette that is as much of a character in the film as the actual figures. For this film, I wanted to use deep blues and purples - colors that I felt were both beautiful and evocative of the emotions I wanted to convey. It took many hours in isolation for me to complete this film. Animation is a lonely yet deeply satisfying process and I hope to continue exploring it in the future.